In 468 BC the tragic dramatist Sophocles won the City Dionysia for the first time. He was about twenty-eight years old, which was good going; Aeschylus gained his first victory when he was forty, Euripides when he was thirty-eight or so, and each of them had been competing at the festival, on and off, for about a decade and a half. One source claims that Sophocles was actually making his debut in 468; it is more likely to have been his second or third outing. It may well, however, have been the first time that he came up against the formidable opposition of Aeschylus, who since 484 had won first prize almost every time he had competed; and Sophocles beat him. Aeschylus was a native of Eleusis, a town lying west of Athens which was home to one of the most famous cults in the Greek world, the Mysteries (i.e. secret rituals, known only to those who had been initiated) of Demeter and her daughter Persephone (or, as Athenians called her, Pherrephatta). So it was a bold decision by Sophocles to build one of his four plays, Triptolemus, around a famous Eleusinian legend. Putting together the thirty or so quotations that survive from the play, and a variety of other references to the myth, the story told in Triptolemus appears to have been something like this – or so Tom Talboy and I have argued in Sophocles: Selected Fragmentary Plays II (Oxford, 2012) 216-231. Demeter, wandering across the world in grief after the abduction of her daughter by the underworld god Hades-Pluto, came to Eleusis, disguised as an old woman, and was invited to become nurse to Demophon, the infant son of the local king Celeus. In gratitude for her kind reception, Demeter decided to make Demophon immortal, and started applying the appropriate treatment to him, anointing him with ambrosia (the food of the gods) by day and burying him in the fire by night. But she did not tell the baby’s mother, Metaneira, what she was doing, and when Metaneira happened to see the nurse putting her baby in the fire, not surprisingly she cried out in alarm – and thereby, as it were, she broke the spell, and that was the end of Demophon. At some point during this episode Demeter revealed her true identity, and Celeus, overcome with grief at the loss of his son and mortified that his daughter had offended so powerful a goddess, apparently committed suicide. Celeus had, however, another son, considerably older, named Triptolemus, and Demeter, much moved by Demophon’s death and by Metaneira’s grief (in which perhaps she saw the reflection of her own), resolved to grant one great boon, through him, to the people of Eleusis, and another to the whole human race. 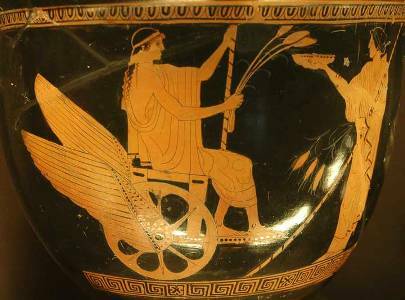 The first boon was the revelation of what were to become the Eleusinian Mysteries, whereby the initiate (if he or she obeyed a simple ethical code) was guaranteed a blissful afterlife; the second was the cultivation of cereals (“the grain of Demeter”, as poets called them). Of the latter gift Triptolemus was to be the dispenser, and she sent him to bring the good news (and the seeds of grain) to the world in a flying chariot drawn by two serpents. Her instructions for the journey (or rather, as we shall see, journeys) seem to have taken up a large portion of the play; at least half the surviving quotations seem to come from this speech, or series of speeches, by Demeter – a pattern that recalls the four long speeches, totalling nearly 200 lines, in Aeschylus’ Persians (produced in 472), in which a messenger narrates the battle of Salamis and its aftermath, or the scene of about the same length in Prometheus Bound (attributed to Aeschylus, but probably composed some time after his death, perhaps by his son) in which Prometheus and Io between them tell the tale of Io’s wanderings, past and future, from Argos to Egypt through many lands known and unknown. In my next post we will follow Triptolemus’ itinerary, so far as it can be reconstructed.